it seemed like a great time to tame this storage shed. There is also a loft upstairs in which some furnishings are kept. The double set of doors each lead to their own space. The area on the right has already been organized. but the after shots come later in this post. Here's how the left side of the shed looked when I started. it only needed a bit of tweaking and sweeping. The first thing I did was to empty it out of almost everything. so that they could be taken to the other side of the shed. to free up some of the floor space. Whenever possible when organizing, I use the vertical space. Next, I dealt with the hanging tools. There are tools here for cleaning, gardening and lawn care. The white cabinet was moved over to the end of these hanging rods. I sorted the hanging tools into like piles. but at this time we are not purging anything, just reorganizing what is there. there is ample hanging space for all of it. Like items were hung together. to see if anything can be donated or sold. was to clean and sharpen anything that will be staying. so that they are ready for spring gardening duties. when I have access to a ladder so that I can reach everything easily. to accommodate new bird feeders. so that the contents are available as needed. Here's the right side of the shed that had been spiffed up previously. What a fabulous structure to have onsite. A spacious potting bench lines one wall. and some odds and ends underneath. The sink right next to it is so handy. that had previously taken up much of the shelving space. as the cabinet is not secured to the wall. This was an enjoyable and very satisfying project. more manageable, or at the very least, less worrisome. Who doesn't want to make their lives easier? Do you have any spring organizing tasks planned? What a great space! 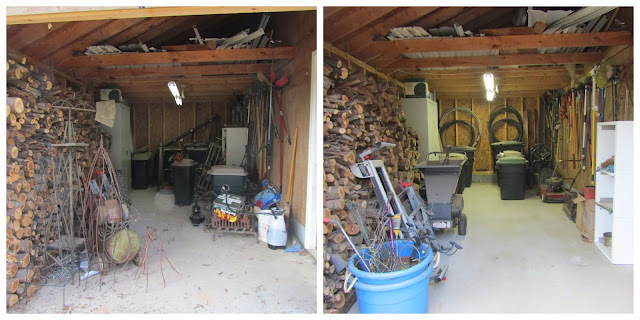 You did a really nice job - it certainly doesn't look so overwhelming in the after. We have our tools hanging in our barn in a similar fashion and it sure does help. I love that you thought of cleaning and sharpening. So much easier to do it now instead of realizing, once you're ready to work, that your tools aren't ready. Yes, it is a wonderful place to keep things in good repair.